Blofield is a growing residential area still retaining a few examples of 18C and early 19C country-type houses. The village has a long history and is mentioned at length in the Domesday Book. The name may have been derived from Anglo-Saxon - to blow - or - to bloom - or alternatively from the growing of woad which was commonly used in early times as a blue dye. Before, and following, the Norman Conquest, the manor was held by the bishops prior to the creation of the bishopric of Norwich in 1064 until the late 16C, after which it passed through various hands including a branch of the famous Paston family. The present church replaced an older building, probably on the same site, of Norman construction, and today it is much as it was built between ~1380 and ~1440. It is the largest church in what was the Blofield Hundred, a subdivision of a county or shire having its own court, and it owed its size and importance to the prosperity of the wool trade and the residence of the bishops as Lords of the Manor. The land is generally level farming country. Last century and into this century Blofield was renowned for the quality of its market-gardens produce and several of those responsible for the highly regarded output are remembered in the surviving names of lokes and lanes in various parts of the parish. In recent years there has been a considerable change to 'pick-your-own' marketing. The village is now a mixture of old and very modern dwellings with a variety of retail shops surviving from earlier years. The number of licensed houses in the parish has within comparatively recent years been reduced to two(previously six). Eighty years ago there were eight licensed houses, ten shops and a number of itinerant vendors; three boot and shoe makers (a little previously six), fourteen skilled tradesmen, and fifteen farmers and market gardeners. In addition there was a well-stocked off-license wines and spirits store. A number of the names of persons remembered on memorials in the parish church and the churchyard are borne by families resident in the parish today. There remain a few of the old footpaths which in earlier times formed the means of communication between the two parts of the parish, and with neighbouring villages. The railway line does not traverse the parish but there is a station at Brundall, one mile distant. There are good road and railway connections with both Norwich and Great Yarmouth, also Lowestoft; and further to the Midlands and parts of the North and West, serving in various degrees some of the surrounding villages. The Norwich - Great Yarmouth road (at one time part of the Turnpike road system) entered the parish from the former parish of Witton (now part of the parish of Postwick) at Witton Runn, climbing the hill to pass the, now demolished, Globe Inn (in the 17C and 18C a popular drive out from Norwich on summer Sunday afternoons) and at the King's Head facing the old Post Office continued left up The Street passing The Swan on the left to the Griffin (later a butcher's shop) replaced by modern housing at the junction with Doctor's Road from the east end of which there were thoroughfares leading to Lingwood and the Burlinghams and so to Acle. The portion of the old A47 from the King's Head to the junction with Doctor's Road was not constructed until 1813. The village remains to this day divided both by the Norwich - Great Yarmouth highway and a widely defined green belt. There are schools in each of the quite widely separated communities, the slightly older one near to the centre of Blofield now much improved and enlarged from its 1877 origin, and 'Hemblington School' in Mill Road Blofield Heath, which also serves the considerable Hemblington population resident within the parish of Blofield. There are nonconform ist churches in Globe Lane and on Woodbastwick Road, and the present branch of the Norfolk County Library was formerly the Parish Reading Room, restored in 1897 by Philip Steward in commemoration of the Diamond Jubilee of Queen Victoria. Before becoming the Parish Reading Room the North Street building was earlier owned in turn by the Baptist and Wesleyan congregations. The Parish Hall was given by William and Margaret Gordon Harker of Blofield Hall and the associated recreation ground was purchased by parishioners as part of the 1914 - 1918 War Memorial. The Harkers also gave the piece of land in Blofield Heath now occupied by Heathlands to the Parish Council in 1922 for the "purposes of recreation of the parishioners." 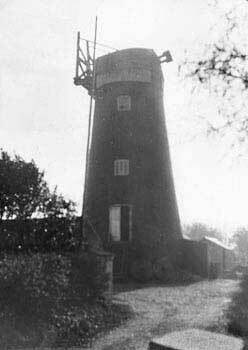 There were at least two windmills in the parish, one in Mill Road and the other on the Lingwood Road east of Waterlow right on the boundary of the parish, to which the local residents would take their corn for grinding. There are two Post Offices serving the widely separated residential areas and a number of letter collecting boxes. The Globe and the King's Head each at one time separately afforded accommodation for the local courts of justice and the postal service. The village stocks stood at the junction of the old main road with Stocks Lane on the bare ground at the eastern end of St. Andrews Close. Stocks Lane continued to its junction with Church Road and thence as Brundall Road to Bay Bridge farmhouse where the moated site may have been occupied by an earlier Blofield Hall with its accompanying game park extending through the marshes towards Braydestone and Strumpshaw. The present Blofield Hall was developed from 'The Groves' by the Harkers, who acquired it from the Tuck family homed in several local villages. At the end of the 11(c) this was the most thickly settled part of England with about fifty people to the square mile. Norfolk was then the most populous county in England according to returns entered in Domesday Book, with more Saxon churches than any other county.